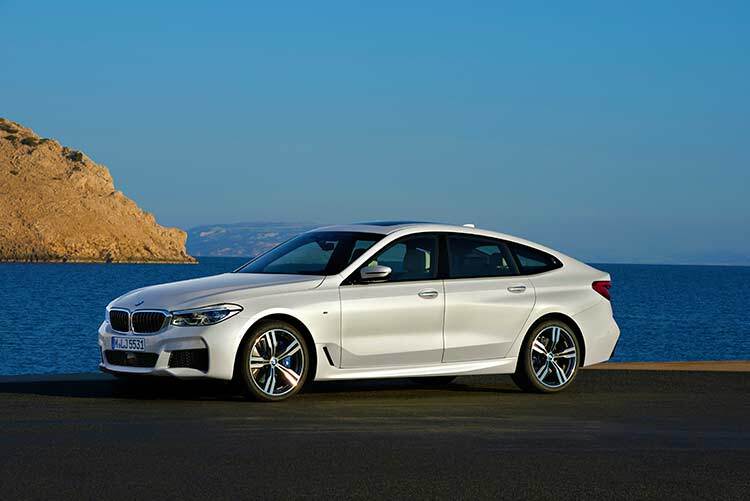 The new BMW 6 Series Gran Turismo combines the innovative vehicle concept underpinning its predecessor with the aesthetic appeal of a coupe. Supreme driving pleasure, luxurious long-distance comfort and a new dimension in cutting-edge functionality are the result. 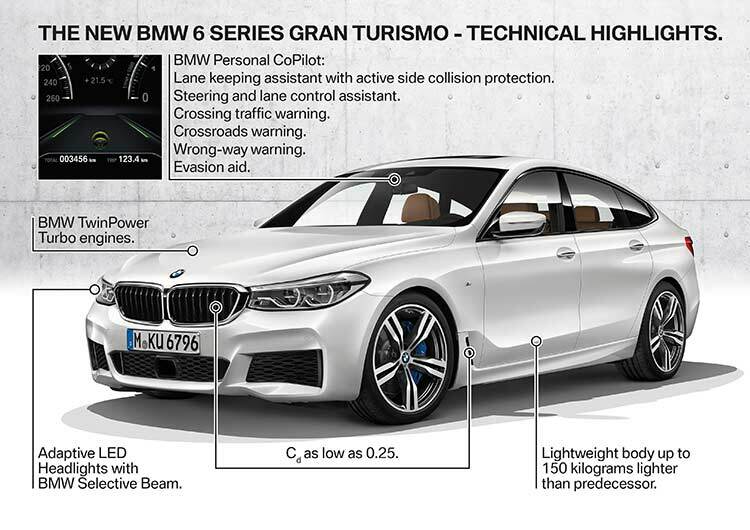 The new model designation reflects a significantly enhanced product substance over the previous BMW 5 Series Gran Turismo. The World premiere of the new BMW 6 Series Gran Turismo was at the IAA 2017 show in Frankfurt, the market launch will be in November 2017. 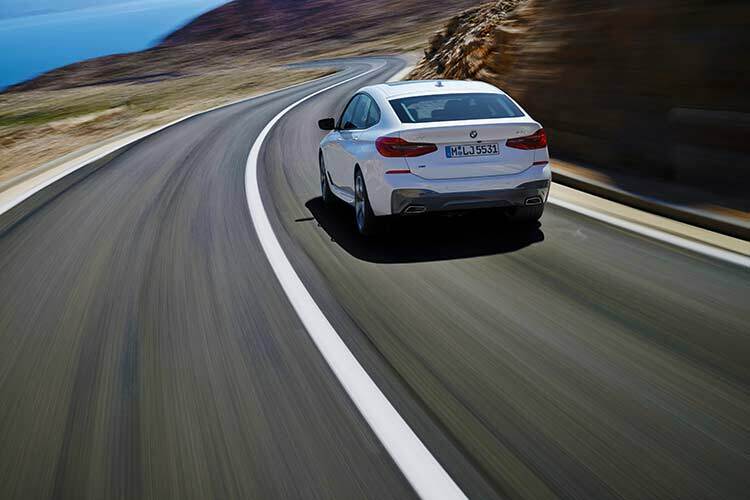 The new BMW 6 Gran Turismo has stretched proportions which include an 87-millimetre increase over the predecessor car’s exterior length to 5,091 millimetres. Width is unchanged at 1,902 millimetres, while the vehicle height has been reduced by 21 millimetres to 1,538 mm making it more sleeker and coupe like. The flowing, coupe-style roofline merges into a rear end lowered by 64 millimetres. The front seats have a raised seating position and more driver-focused cockpit design. 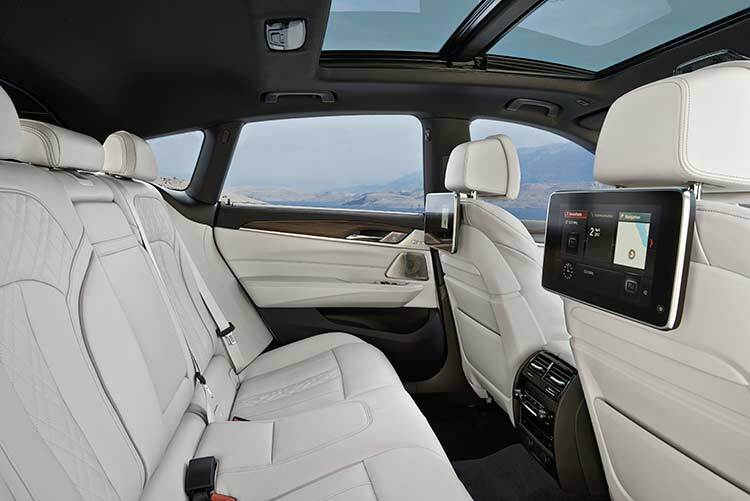 Three full-size rear seats provide generous legroom and more headroom despite the lowered roofline. For true luxury electrically adjustable comfort seats can be ordered as an option for the rear. Rear seat backrests split/fold 40:20:40 (by means of a remote release system in the boot). Boot capacity can be increased from 610 litres (+ 110 litres vs. predecessor) to as much as 1,800 litres (+ 100 litres). The new 6 GT has grown in all areas but not in weight with vehicle weight reduced by an average of 150 kilograms. 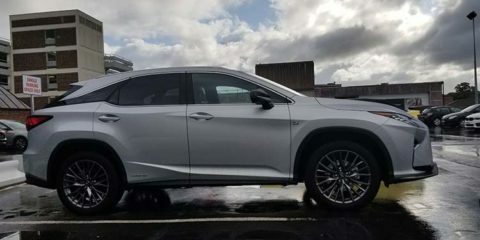 Also the aerodynamics are significantly improved thanks to a low-slung silhouette, active air flap control, Air Curtains, Air Breathers and an automatically extending rear spoiler. Cd went down to as low as 0.25. 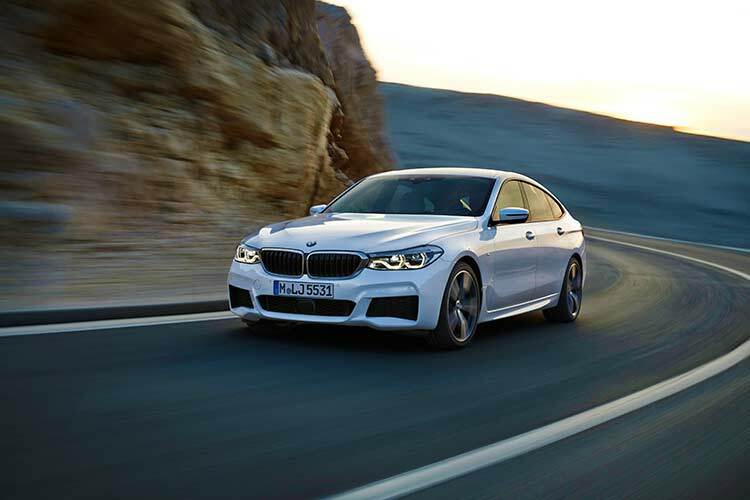 The new BMW 6 GT has unrivaled balance of dynamic excellence and superb ride comfort, the rear axle air suspension with automatic self-leveling now comes as standard. Two-axle air suspension, Dynamic Damper Control, active roll stabilisation and Integral Active Steering are optional. Vehicle height can be adjusted either automatically or at the touch of a button. All suspension systems can be specified in combination with BMW xDrive. The display and control concept are unrivaled in this class. 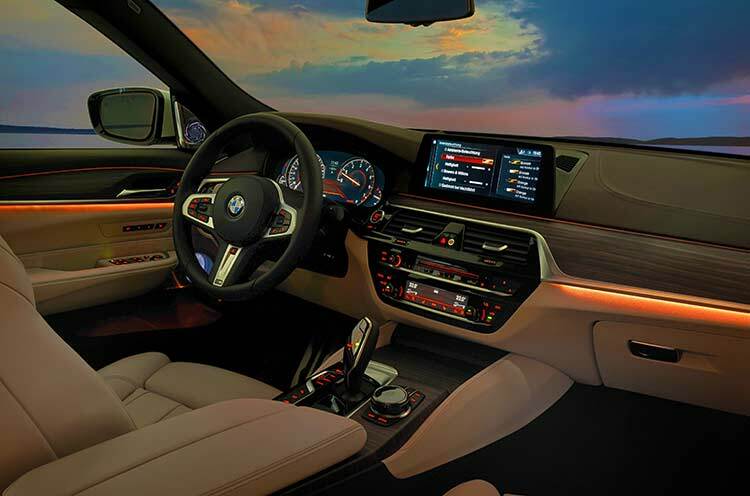 The updated BMW iDrive includes a 10.25-inch touchscreen and tile-style menu display with live content. 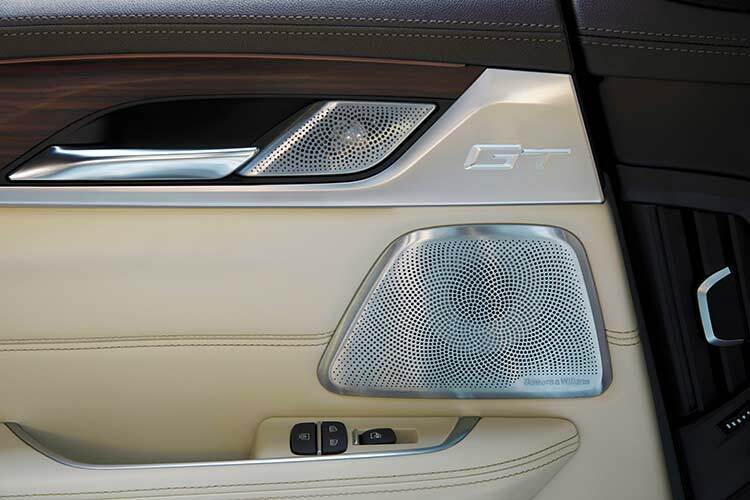 The voice control system recognises instructions formulated in everyday language. 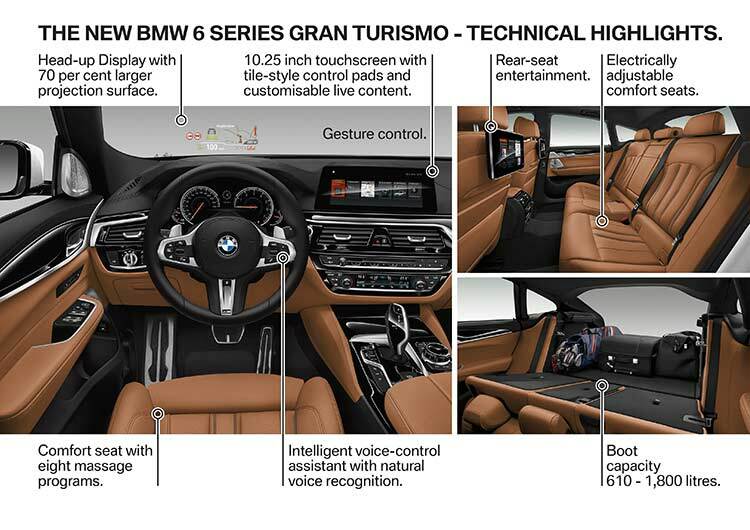 BMW gesture control and the latest generation of the BMW Head-Up Display are optional. Daytime driving lights, low-beam and main-beam headlights, front fog lamps and rear lights with LED technology now come as standard. 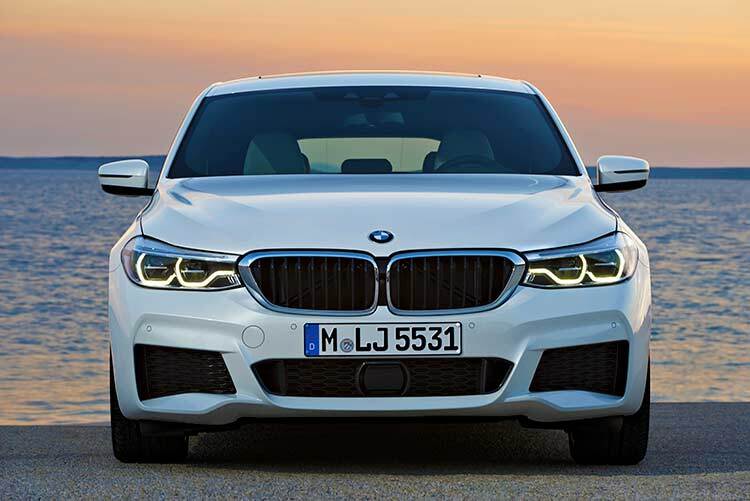 The LED headlights with variable light distribution and BMW Selective Beam anti dazzle high beam are available as options. There is further progress towards automated driving through driver assistance systems such as the further developed Active Cruise Control with Stop & Go function, Steering and lane control assistant, Lane Departure Warning system, Lane Change Warning and Side Collision Warning, evasion aid, Crossing traffic warning system, Priority warning and Wrongway warning system, plus hazard warning through link-up with other BMW vehicles. 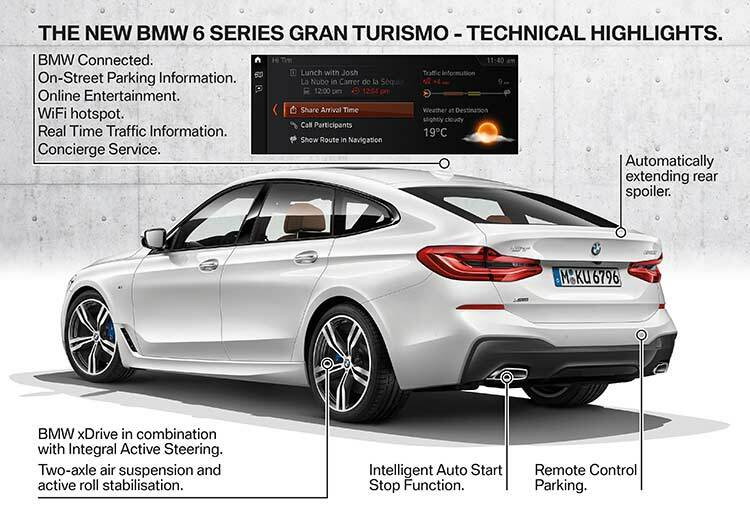 There is also a Remote Control Parking option using the BMW Display Key. BMW Connected serves as a digital personal mobility assistant. The link-up between the car and a smartphone provides seamless integration. 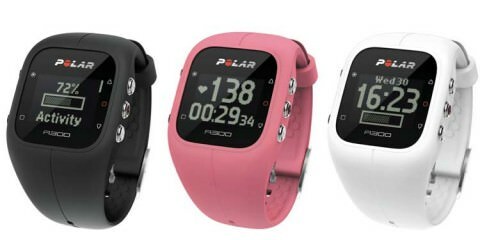 Unrivaled breadth of functionality enhances individual appointment and mobility planning, communications and infotainment. There is Real Time Traffic Information and On-Street Parking Information. Calendar, e-mail and contact data are managed via Microsoft Exchange. 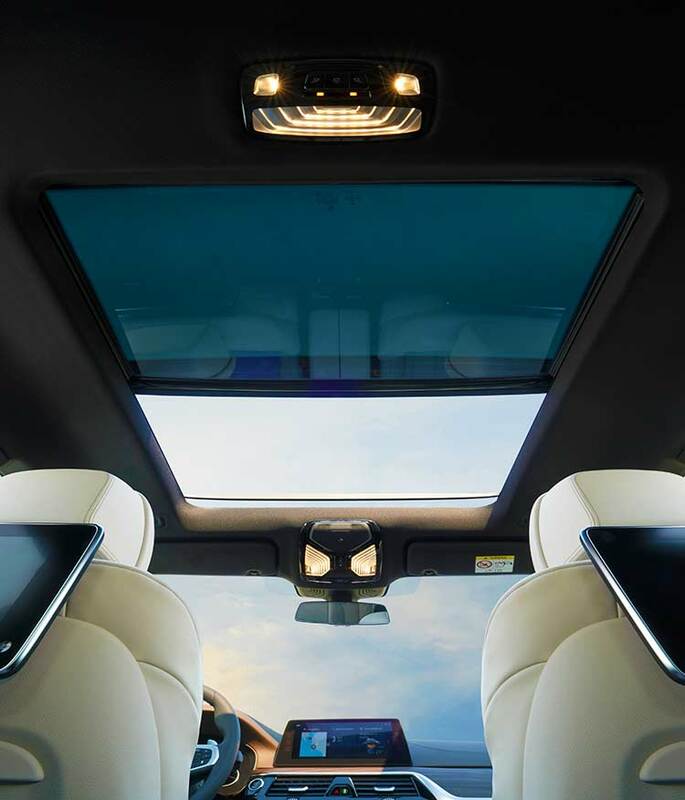 The use of Bluetooth and inductive charging enable wireless smartphone integration, with the use of Apple CarPlay and a WiFi hotspot up to 10 devices can stay connected. Two petrol engines and one diesel unit are available from launch, with the eight speed Steptronic transmission fitted as standard. The BMW xDrive all-wheel drive will be offered for two engine variants. 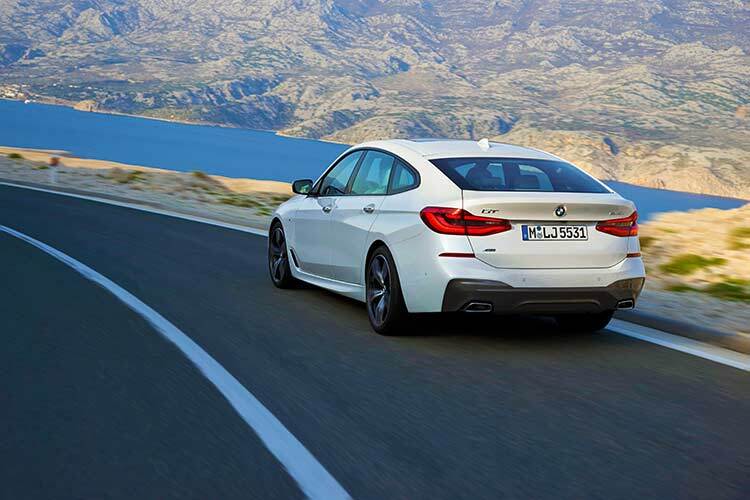 Acceleration from 0 to 100 km/h (62 mph) is 0.7 seconds faster (BMW 630i Gran Turismo) than with the predecessor model, fuel consumption and emissions are reduced by up to 15 per cent (BMW 640i Gran Turismo, BMW 630d Gran Turismo). 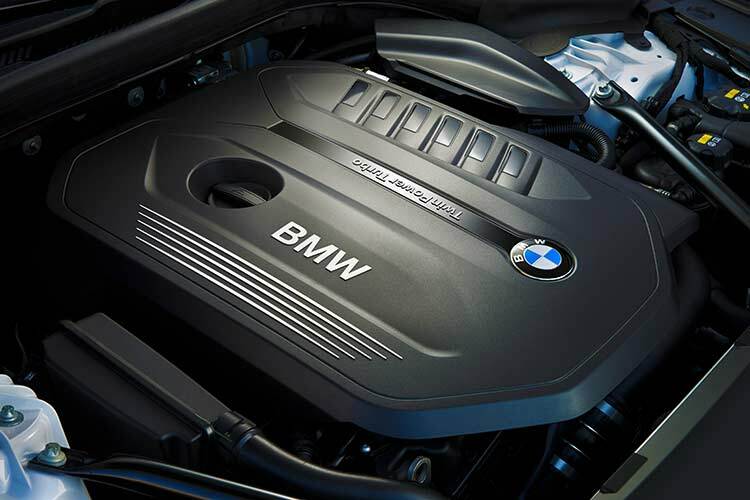 The diesel engine will have Blue BMW Performance, including SCR catalyst.